The path Allister Mulligan took to running his own desk business in Belfast is an interesting one that could have easily taken a dramatic turn at many points. The Clogher Valley man, who grew up with four brothers, a father who was a small poultry and beef farmer, and his mother, a former school teacher, is a self-confessed "wheeler dealer". A passion for buying and selling encouraged Allister (57), who attended Fivemiletown High School, to study business at Ulster University after a stint at the former Omagh Technical College. "I was always buying and selling and in those days it would've been things like mail order stamps and then I moved on to other things," he says. "The expectation would be that you would stay on the farm and that is still the same for a lot of young people even though there's no money in it now. You'd be expected to carry on the family tradition." But the reality is that only one of the Mulligan siblings stayed on the farm, while the three other brothers moved to Australia, Abu Dhabi and Essex to work in IT, engineering and banking. After college Allister went on to win one of the first trainee accountancy positions offered here, in Shorts. It was a pilot scheme that saw him train and practise chartered accountancy. He then became the accountant for the now hugely successful Mount Charles catering firm. "It's my claim to fame that I was their first ever accountant in 1989," he says. "The role didn't just entail doing the books, you buttered sandwiches if you had to and I liked that. I liked being hands-on. I don't like situations where you are an accountant sitting in a corner and expected not to get involved in anything else." In 1992 Allister moved to Norse Irish Ferries where he worked for a decade. He describes his time there as "the best years of my life". When the company was put up for sale, Allister revealed that he and a co-director were engaged in talks to buy it over. "It was almost a done deal but at the very last moment the owner sold it to another buyer who came in with a ridiculous amount of money," he says. He says, if that deal had have gone in his favour, he would still be where he is right now - running his own firm. "If I stayed my ambitions were to retire at 50 and start my own business," he adds. Desk Warehouse has been trading for 26 years. It sells desks to firms all over the UK with some stock having made its way as far as Afghanistan, but that's a rarity, Allister is quick to add. "There wouldn't be much of our stock going outside of the British Isles but on occasion we have had customers in Germany and further afield." The business model that Desk Warehouse uses is unique in its field. While it does a huge percentage of sales through its website it still offers a bricks and mortar retail element in a warehouse based in a former linen mill on the Beersbridge Road in east Belfast. But how did the group finance director, and manager, of a successful passenger and freight firm eventually find himself in the business of selling desks? "It started off with an auction at the Harland & Wolff drawing rooms where I was looking for a desk for my home. "I thought I'd buy a few and got carried away and ended up with 363 desks which I stacked up in the back garden. I sold those from home but I knew that couldn't last so I took on premises and sent someone else in to run it. It took a further 10 years before I began to run it," recalls Allister. Admittedly the move wasn't a career choice, he adds, but "I realised it had massive potential and could make a profit". And so second-hand desks evolved into new stock and a new premises with a bigger customer base. A website followed, the reach of which still amazes Allister. "I find it amazing that someone in Inverness yesterday clicks on a button and finds us. People don't care where you're located, they're attracted by a website and prices." Around 15-20% of Desk Warehouse's business is done in Northern Ireland. And today, while the office environment is changing, business is buoyant for Allister. However, it's been a long time coming. "The business grew up until the recession in 2007 and in that year our turnover halved. It was like driving a juggernaut into quicksand. "That was really difficult and we had to cut way back in staff and overheads then four or five years ago business started increasing. Last financial year we were back to where we were but it's depressing that it took 12 years to get there," he says. Desk Warehouse has been catering to an ever-changing 9-5 setup. Allister says current trends have seen him deliver more home-based offices which he believes is reflective of a shift in employer attitudes. "The standard people are looking for has increased dramatically and we have a lot of employers paying for at-home desks and chairs. We've done a substantial amount of that over the last few years and I think that's to do with a focus on a better quality of life and employers looking after staff including working mothers." He adds that space and comfort is key for many employers. "Years ago they would've tried to cram as many people in as possible. We don't have a lot of Google-style offices yet but we're getting there. The value of employees matters now." Asked if he believes the upward trajectory for his business will continue, even with Brexit looming, Allister's response to what might happen is pretty much in line with that of any other business person: "I've no idea". He says his stock is mostly sourced from the EU and Far East, a move that came out of the recession which saw his former UK suppliers go into administration. "Most of them didn't survive the recession so we source from China, Poland, German and the Far East. I don't know what impact Brexit will have and I think that's the problem, no one knows. I suppose its affect on the exchange rate could go either way." Despite the uncertainty Allister is planning big things for later in the year including doubling his floor space and doubling turnover. "That's our unique selling point, the warehouse. The showroom is 8000 sq ft and we've bought part of the complex in the old mill to extend that. "A lot of our competitors sell from a catalogue but with us you can come in and see it and feel it," he adds. 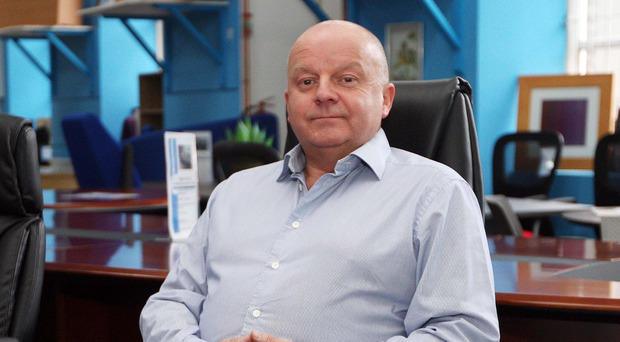 Allister currently employs 10 staff members but his family play a role in the business with his daughter and two sons having all worked at the firm. All three have decided to follow a different career path to their father. Their mother Ruth is a rheumatoid specialist nurse at the Ulster Hospital. They are aged between 20 and 27 years old. His daughter Margaret is an engineer in Frankfurt while his son Peter is a teacher in Belfast. His youngest son Harry is studying biological sciences in university in Liverpool and comes back every summer to work at the business. "I joke with him that if he does a Masters I could get another three or four summers out of him," says Allister, who has no intentions of retiring any time soon. He will however ponder reducing his hours and says the "very good team" he has in place could afford him that luxury. With that time Allister says he would engage his passions; rock and heavy metal music and collectables. An avid Status Quo fan, Allister has seen the group perform 122 times. "Music is a great equaliser. I go to fan clubs and meet people from all walks of life. There could be millionaires there and there could be unemployed people but no one talks about work and there's no politics. It's fantastic." His other hobby is "completely different" he reveals. "I'm into collectables, paper antiques. It could be old books, postcards, advertising. "Theoretically I collect to sell but I end up hoarding them," he says.